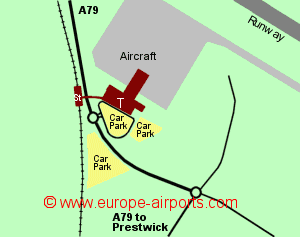 There is a train station at Glasgow Prestwick airport (located approximately 50m from the terminal building and accessed via a covered walkway) with trains every half hour (hourly on Sundays) and a journey time to Glasgow of 50 minutes. 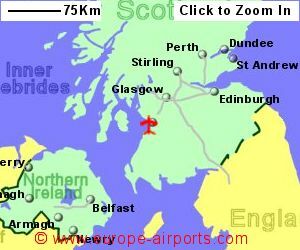 There is also an express bus service connecting the airport to Glasgow and Edinburgh, including a night-time service. Short term car parking is located adjacent to the terminal building while the medium/long term park is approximately 200m walk via the station. Further long term parking is located a distance of approximately 5km by road, having a shuttle bus service to the terminal. Facilities include 5 bars/restaurants, 4 shops, ATM's, 2 currency exchange facilities, luggage lockers, WiFi internet access. 696,000 passengers were handled by Glasgow Prestwick airport in 2017, a rise of 3% from the previous year, but well below the 2.4 million record of 2007, due largely to Ryanair moving many of its flights to Glasgow airport. 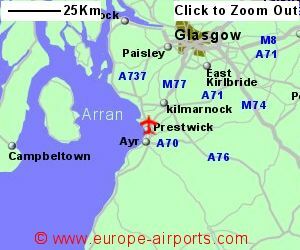 Sorry but we do not have any details of regional flights to Glasgow Prestwick Airport.